If you’re a blogger or journalist and read nothing else this week, make it New York Times story “Paris Attacks Give Rise to Fakes and Misinformation“. The Nov. 16, 2015 postmortem shows why, why, why I constantly harp about responsible sourcing. The Internet is not a reliable news source. You must corroborate and should, never, never, never second source anything you can’t confirm independently, or, in the case of breaking events, you can trust reliably. I’ve been bitching on this blog since posting, in May 2010, “The Difference Between Blogging and Journalism“; September 2011 followup: “Single Sourcing is the Source of News Evil“. Or you can refer to the chapter on sourcing from my ebook Responsible Reporting: A Field Guide for Bloggers, Journalists, and Other Online News Gatherers. Reporting accuracy starts with responsible sourcing. Today, there is too little of it. 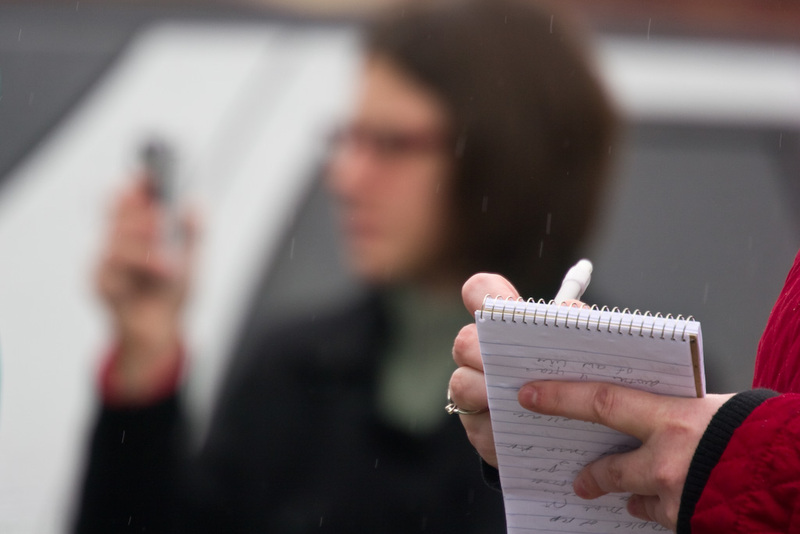 As a news gatherer, the only commodity of value you have is trust—that you can be trusted. For example, if you source Twitter without corroborating, or even trying to corroborate, the source you violate what I call the Prime Directive: Write what you know to be true in the moment. But, particularly for ongoing events (like the Paris bombings), expect what you know to be true to change as more information becomes available. But that’s just one aspect of responsible sourcing. Social media isn’t the major second-hand source used across the Internet. There is common practice of bloggers or journalists citing reports from other sites supposedly gathering news responsibly, if at all. Simple rule: Rarely single source and avoid second sourcing as much as possible. Using a single source is often careless. Referring to another blog or news source as single source is reckless. Reporting news based on a single, anonymous source is negligence. Good journalists are mindful of their sourcing, particularly those sources who aren’t identified. As the Paris event demonstrates: Gossip and rumor run amok masked as news, whether spreading across social media sites or by bloggers or journalists writing news reports. Let be me clear: Just because everybody says something is true doesn’t make it that way. Journalists need to get back to basics and source stories from credible sources, not someone else reporting X, Y, or Z. Bloggers aspiring to be good journalists must adapt to standards of accuracy, accountability, and, most importantly, sourcing. Accuracy and accountability standards are difficult to maintain without good sourcing. Sourcing another blog or news site without seeking to extend the story is weak journalism at best, negligence at worst. Here’s a simple rule: As previously stated, trust is your commodity. You pass the trust in your sources onto your audience that depends on you reporting responsibly and accurately. Ask yourself: “Do I trust the source?” If you can’t answer yes, don’t cite the source, whether one you get first-hand or from somewhere else. Something else: As a general rule, the more inflammatory or conspiratorial the digital media or text information, the more you should scrutinize source disseminating it—start by asking the “Who benefits?” question. Take the screenshot below, as example. Grasswire Fact Check demonstrates the authority and effectiveness of responsible tweeting. If you don’t follow the feed, you should. Background: Vice, which reporting I trust, explains that a photo spreading across social media this week is a fake. The original shows journalist Veerender Jubbal holding an iPad. 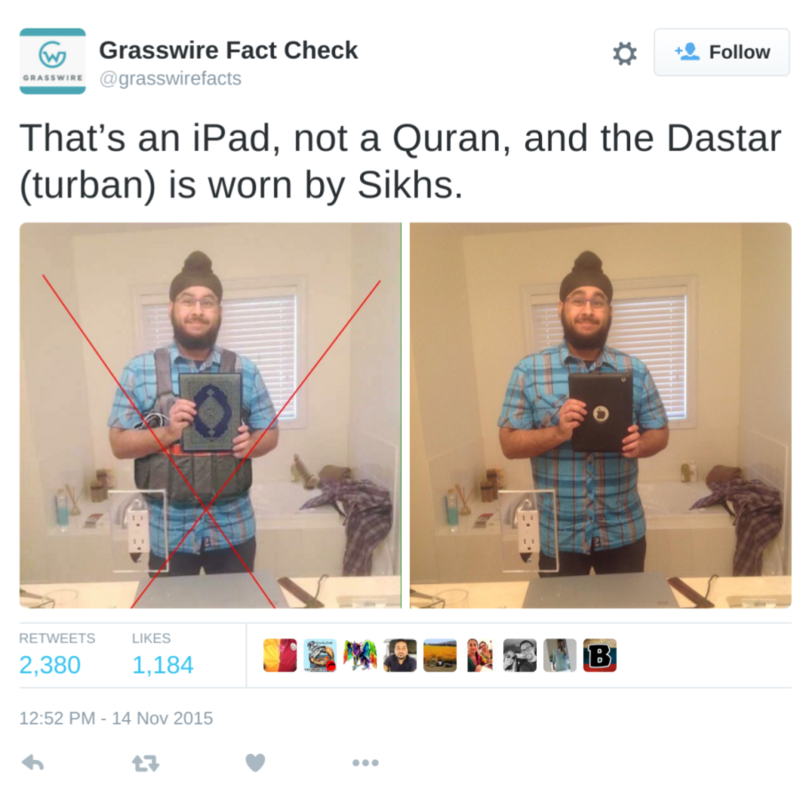 The doctored pic puts the Koran in his hand and bomb vest on his body. Vice traced the photoshoppery back to the so-called Gamergate community (See Flickr a Day 11 on this blog and Wikipedia for more information). Veeremder confirms the photo is a fake. He is highly critical of reported sexism surrounding Gamergate. Who benefits from the photo spread across social and news media? Read up on the whole Gamergate thing, and the answer is obvious. Responsible reporting starts with responsible sourcing. Be trustworthy but use sources you trust impeccably. Veerender sums up his entanglement: “In gauging this entire incident—millions upon millions of people have seen the photoshopped images, and have placed me as a terrorist”. But the chilling statement, he laments: “This is libel from news, and TV”. Stated differently: His peers and people he should be able to report responsibly. The Fourth Estate. That’s you and me.